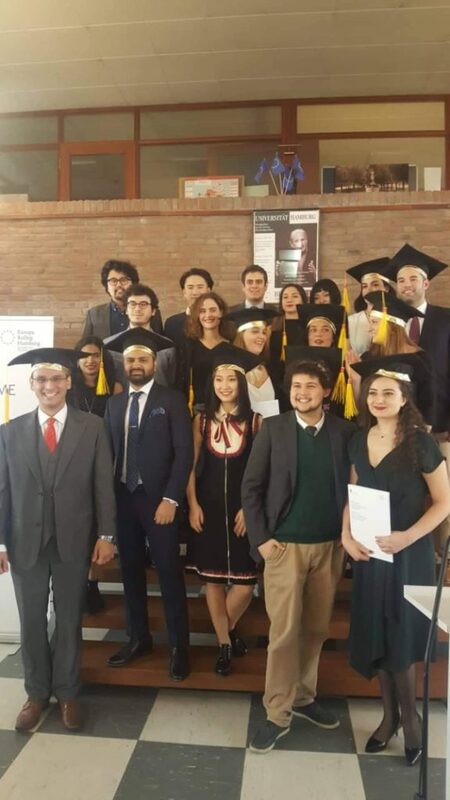 On Friday, 25 January 2019, the students of the 2017/2018 graduation class of the Master Programme of European and European Legal Studies were awarded their certificates in a ceremony at the Europa-Kolleg Hamburg. Prof. Dr. Markus Kotzur, the President of the Europa-Kolleg Hamburg Foundation, in a speech paid tribute to the achievements of a combined total of 14 students from 11 different countries and at the same time showed his pride in the graduation year. The ceremony was also accompanied by a quintet playing various pieces of classical music. Prof. Dr. Ursula Schröder, Director of the Institute for Peace Research and Security Policy at the University of Hamburg, held a speech on the fragility of the European peace order within the framework of the ceremony and in times of increasing division and radicalisation of parts of society. She paid tribute to the achievements of the European Union, which would have made possible the longest period of European peace. At the same time, however, she did not exclude the European project from criticism and argued for a democratic exchange on the future shape of the European Union and its institutions.